CUMM OR CUSTOMER. ID. 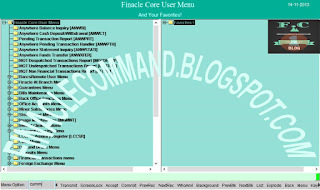 CREATION - FINACLE COMMANDS AND TUTORIALS. 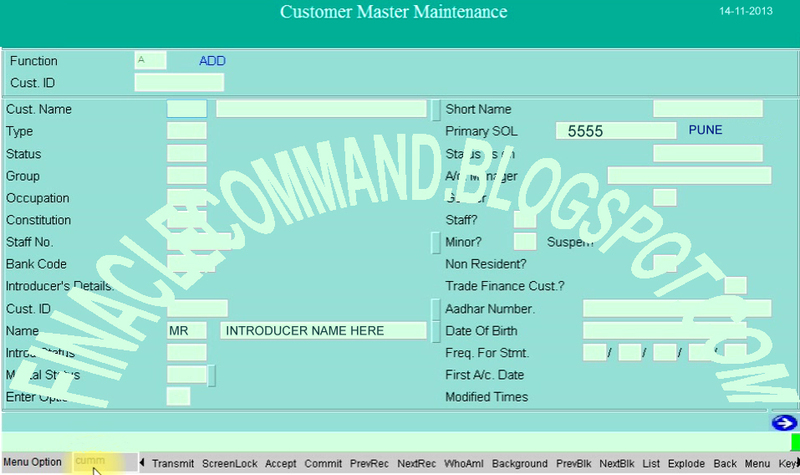 A BRIEF INTRODUCTION TO CUSTOMER MASTER MAINTENANCE (CUMM) OR CUSTOMER ID. 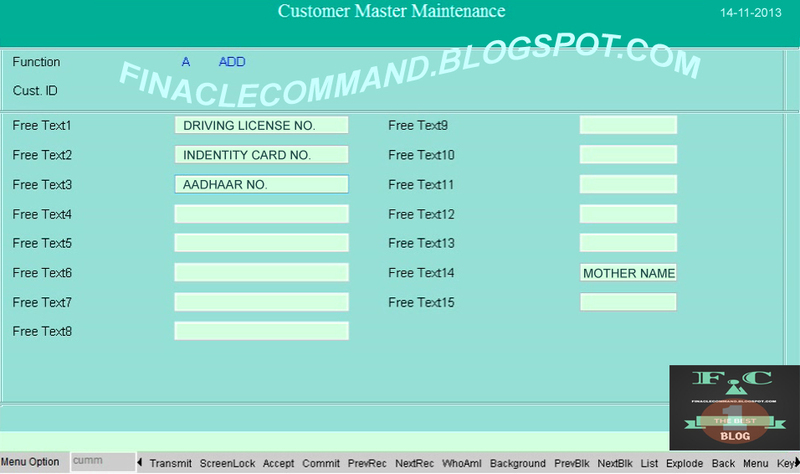 Once the customer ID is created any account opened by that customer will be linked to this particular ID. 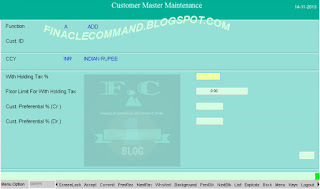 Hence due care is taken while filling the all details of customer in finacle. 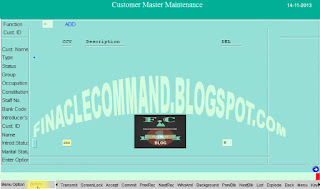 The process is known as Customer Master Maintenance (CUMM). Log in to finacle and in menu option enter option CUMM and press enter. 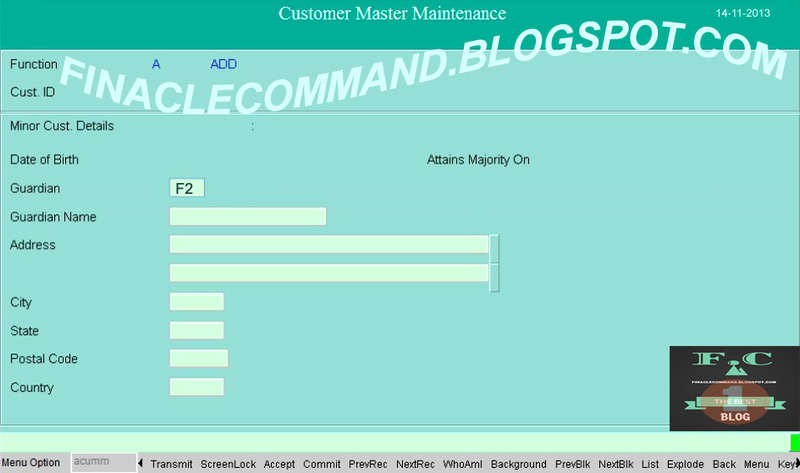 Fill in all details of the below screen. 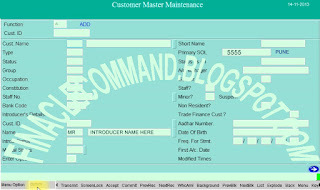 Ensure the short name should contain the first name or middle name of the customer. Now enter non-mandatory fields i.e type, status, group, occupation & Gender.. Fill in Communication,Employee or Permanent Address in below shownscreen and Press F6. In Mobile No. 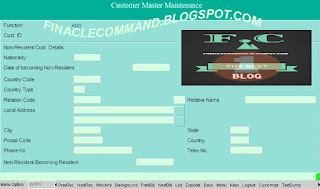 fields Please enter the mobile number because some banks create sms alert services to the customer and copies the Mobile No. from this fields. 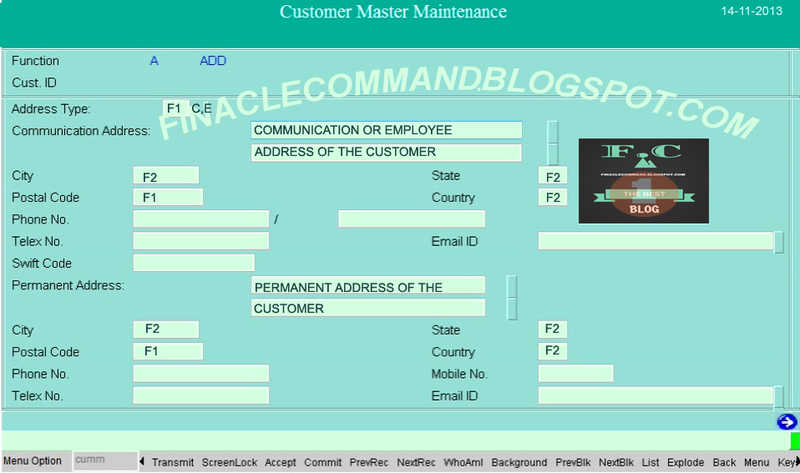 The Next page appears same as shown below, which contains Employer Address. 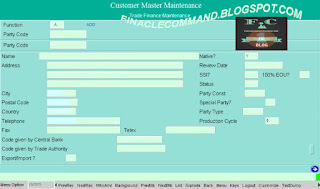 If applicable fill in the same details as shown (in 4 step) above properly and Press F6. This Step contains two details simultaneously i.e. 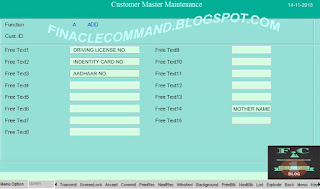 (a) Customer,s Health and Caste Details. 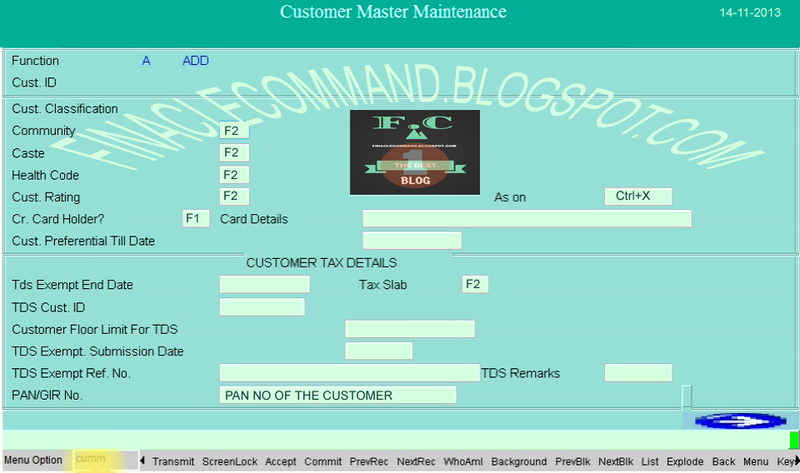 In TAX SLAB fill TDSPU if the customer had a Pan Card and fill the Pan No. in PAN/GIR NO. field. If the customer have not a Pan Card then fill TDS20 in Tax Slab and in TDS Remarks fill FORM60. 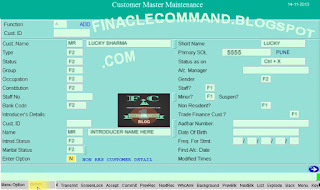 Input the financial details of the customer if applicable otherwise press F6. 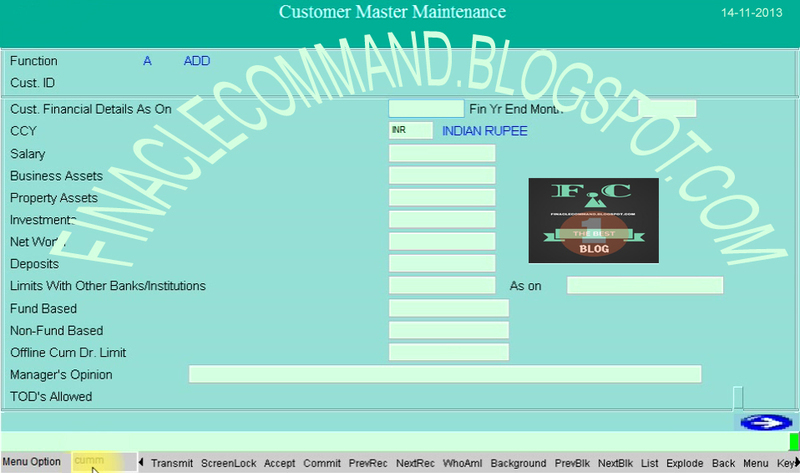 Input the Passport,Purge and DSA ID details if applicable and press F6. 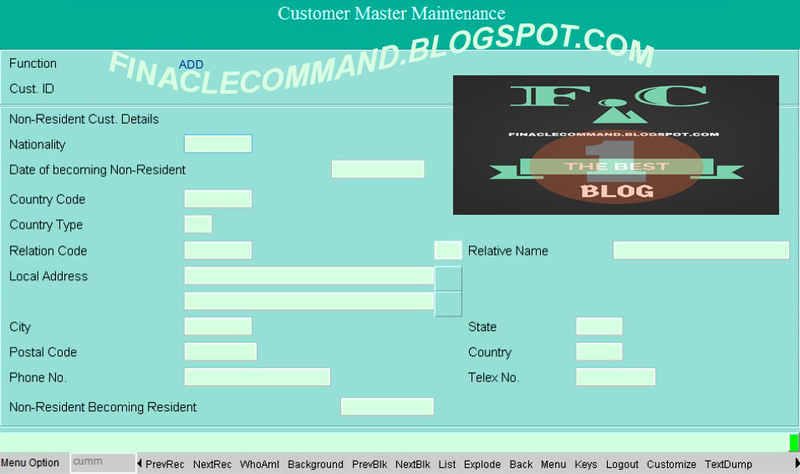 Now in Free Text 1,2,3 and 14 enter the details as shown in image below and then press F6. 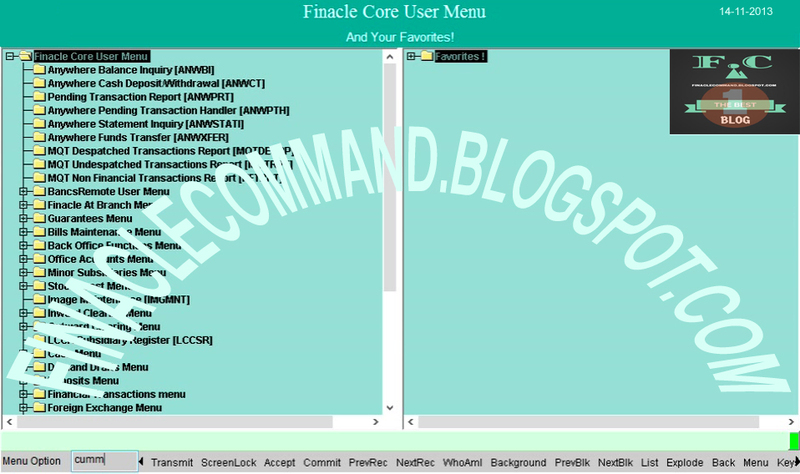 Now in Free code 10 enter the Free Codes as described by your bank or you can press F2 or F1 for help if you are not aware about what to fill in free code fields. The General details of Customer Master Maintenance are now completed at this stage. 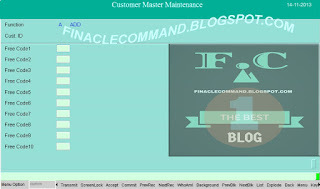 Press F6 and Press F4 for accepting the General Details. 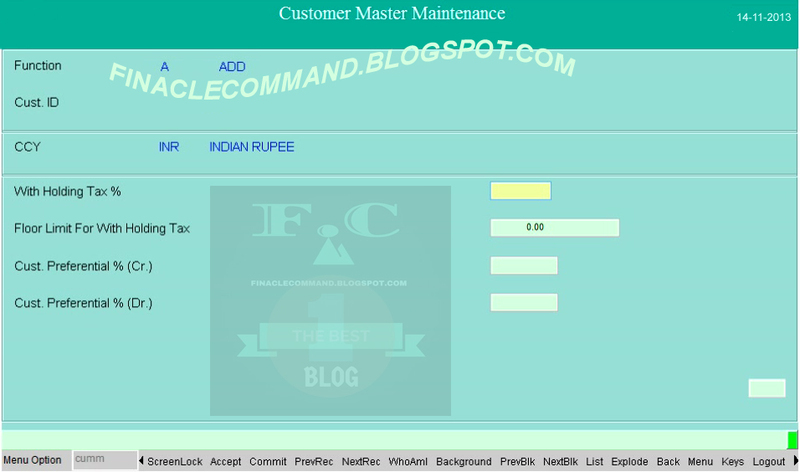 Now you can carry on your journey of CUMM creation by filing E - DETAILS shown below. Press F4 (2x) twice,In case the customer is neither Minor nor Non-Resident nor Trade Finance Customer. Press F10 for final commit. 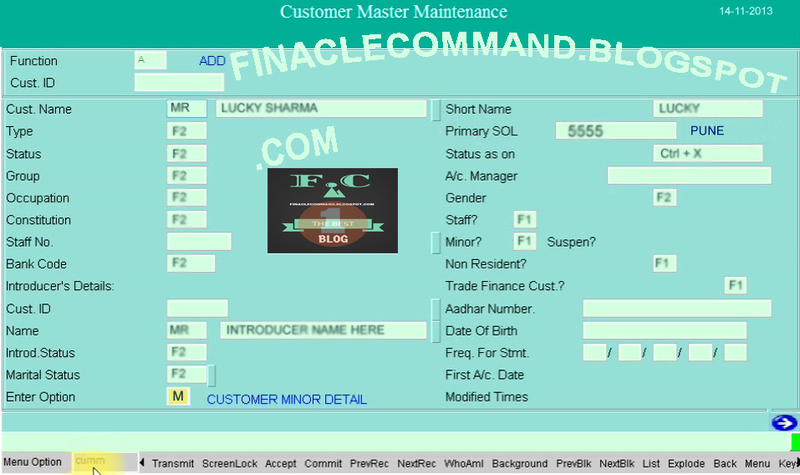 If the customer is a minor type 'M' in Option Block and Press F4. 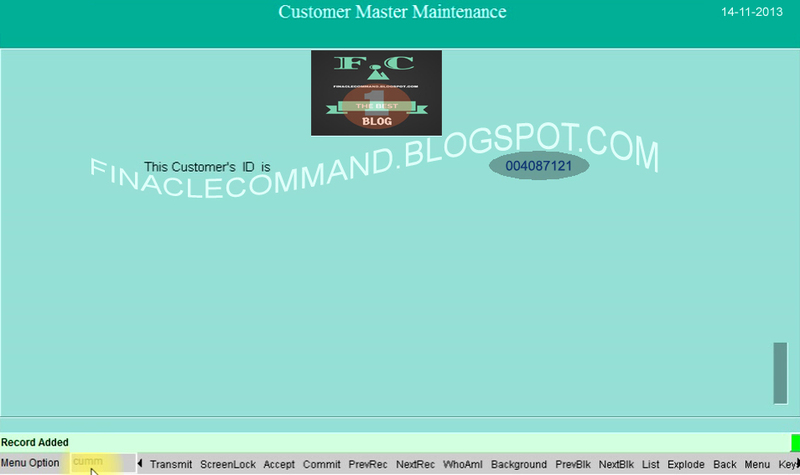 Now the following screen appears,Input the Minor Details and Press F4. 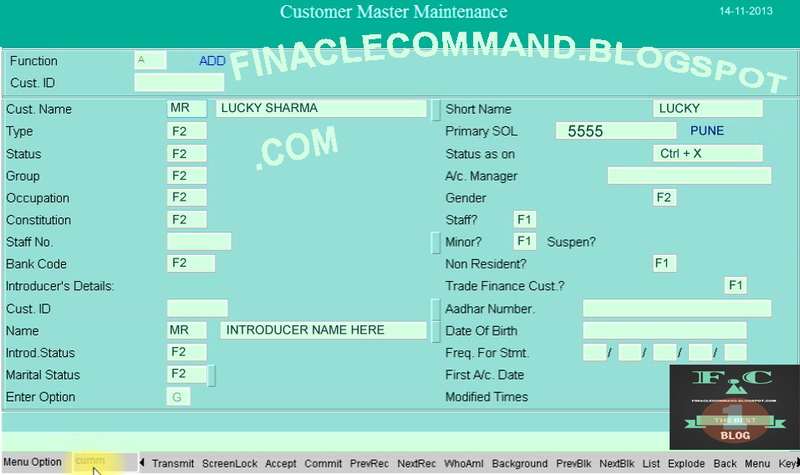 If the customer is a Trade Finance Customer, type 'T' in the Option Block and press F4. Now the following screen appears,Input the TRADE FINANCE CUSTOMER Details and Press F4. 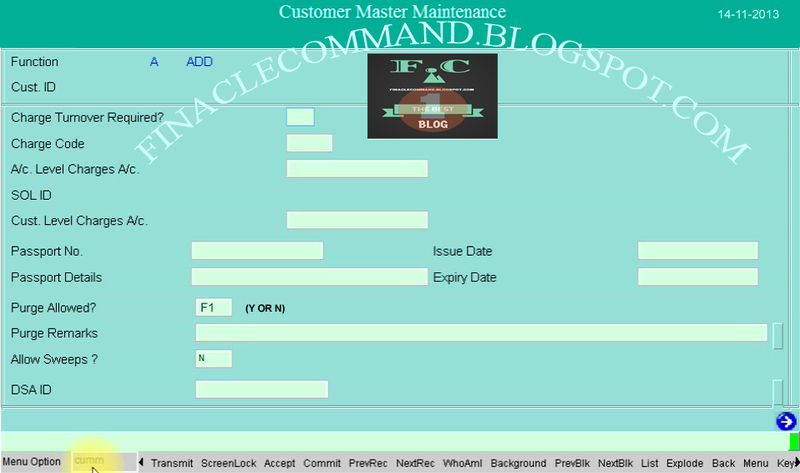 If the customer is a NON-RESIDENT CUSTOMER enter 'N' in the Option Block and Press F4. 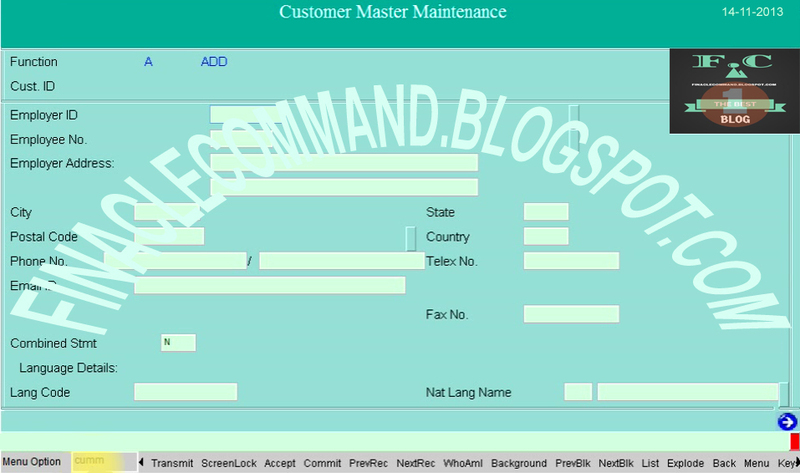 Now the following screen appears,Input the NON-RESIDENT CUSTOMER Details and Press F4. 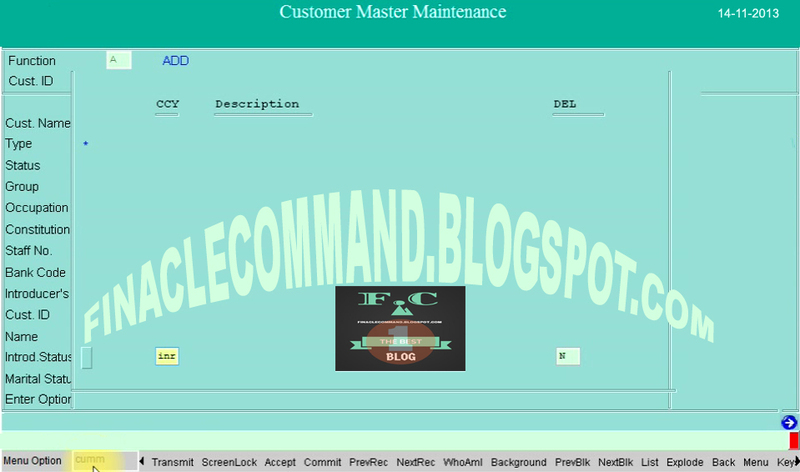 Press F10 to finally Commit Customer ID will be generated and displayed on the screen as Above.